Minako Aino is light-hearted middle school student who bounces from one daydream to another. So naturally, encountering a talking cat named Artemis is just another dream…right? Unfortunately, Minako has to face the truth by taking action first and getting explanations later when she’s thrown into a fight with her latest crush, who seems to be possessed! Once the battle is over, Artemis informs Minako that she has a mission to protect Earth against evil agents of the Dark Agency, who keep sending idols to enslave the public. But even with all of her newly-bestowed powers, Minako still has trouble avoiding the agency’s traps; after all, any teenage girl loves an idol! And not all idols are evil…are they? Codename: Sailor V is the prequel to the mega-hit series Sailor Moon, which is credited with redefining the magical girl genre into what it is today. 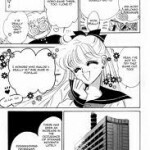 Since many elements of Codename: Sailor V are used again in Sailor Moon, it’s safe to say that Codename: Sailor V is a breakthrough manga in itself. Not only was the manga the first in which a magical girl used her powers to fight evil, but it also introduced other new elements to the field, such as the use of fashion accessories as weapons and powerful alter-egos. 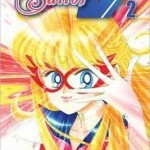 Some readers hold the understandable opinion that Codename: Sailor V is merely a rough draft of Sailor Moon, but reading it is essential to a greater understanding of the larger series’ plot. Furthermore, it’s a good read! 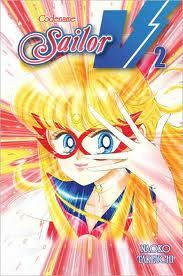 The series isn’t as strongly-plotted as Sailor Moon, but in this particular case, it isn’t such a bad thing! 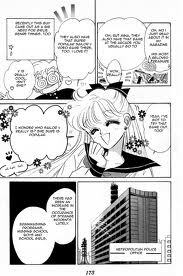 The lightheartedness of the series allows room for more comedy, and it’s quite interesting to read Takeuchi’s basis for Sailor Moon and watch it develop. Minako is a very realistic depiction of a young teenage girl—carefree and energetic, with an ever-changing crush. Nearly twenty years later, this characterization sounds stereotypical, but Minako is indeed the original. The villains in the manga are certainly unique, considering that they are the first. They do get formulaic over time, but not excruciatingly so. Codename: Sailor V did indeed lay the foundation for a whole new manga plot, but the depiction of a girl fighting evil did so much more than that. Magical girls were no longer simple-minded children flying in the sky and playing with fairies; Takeuchi gave them a purpose. Even to this day, women are viewed as somewhat lesser in Japan, so it’s perfectly reasonable to assume that magical girls didn’t have much of a purpose in manga because women weren’t credited for having much of a purpose in the real world; fighting was a man’s job, strength was associated with men. Minako proved that girls could also be strong, especially to other girls. 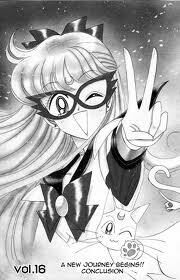 While Minako is merely an average girl, when she’s Sailor V, she can stop bullies and wrongdoers. If she can do that, then it isn’t much of a stretch for a little girl to believe that she too can stand up for what is right and make a difference. Again, Takeuchi entered a whole new realm in the manga world by designing a “superhero” costume for a magical girl. Not only did she manage that, but she was creative enough to design accessories that could both be used as weapons and to sport the latest fashion. Her artwork as a whole seems somewhat plain compared to what one sees in manga today, but one has to consider that manga has evolved a lot over the past several years, and Takeuchi’s art was pretty stunning for her time. Her girls are certainly drawn beautifully, but I was surprised to note that the forms and poses of her characters often appeared weak. Every now and again, I would stumble across incredibly rough line art. Perhaps it was just drawn with too much haste. 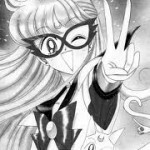 Even though Codename: Sailor V isn’t quite as good as Sailor Moon, it’s a fun read, and who can deny that it’s revolutionary? Any fan of Sailor Moon should take the time to read the prequel in which it all began; noting how the two series connect makes it all the more interesting.